An increased level of health for all Americans is key to the promotion of thriving lives, economies, and communities. Current reform efforts to lower costs and promote value in the health care system are rewarding value over volume and emphasizing prevention and care coordination in the optimal balance with treatment. However, improving health will require more than even the best performing medical system because disease rates and costs cannot change by acting solely within the walls of hospitals and clinics. Addressing non-medical health drivers will require innovative, comprehensive solutions from the public and private sector. Today, the private and public health care markets are embracing the opportunity to improve health by piloting new value-based payment and delivery models, digital and data platforms, and community improvement strategies that address and incorporate upstream indicators of health. The information below is intended to inform interested parties of these existing resources and best practices that can be leveraged to address the social determinants of health. The resources included on this page are not an exhaustive nor endorsed list. We have initially drawn heavily on work our members are directly familiar with, but this is intended to be illustrative of a broad and evolving body of work in the community rather than exhaustive accounting of work in the field. Please visit the site over time as we continue to update as the field evolves. The Center for Disease Control and Prevention (CDC), through partnerships with health care purchasers, payers, and providers, are aiming to improve health and control costs using the 6/18 initiative. The initiative targets six common and high-cost health conditions (e.g. tobacco use, high blood pressure, health care-associated infections, asthma, unintended pregnancies, and diabetes) using 18 proven interventions. CDC partners with 15 state Medicaid programs and their respective state public health departments to implement and improve the 6/18 interventions in their populations served. States responded on their experience and how it has positively impacted their states. Expanding access to evidence-based tobacco cessation treatments, including individual, group and telephone counseling and FDA-approved cessation medications. Removing barriers that impede access to covered cessation treatments, such as cost-sharing and prior authorization. Promoting the increased use of covered treatment benefits by tobacco users. South Carolina’s Medicaid agency partnered with DHEC, the state’s public health agency, who assisted in the 6/18 initiative through leveraging surveillance data and reinforcing South Carolina’s tobacco quitline for free counseling with skilled behavioral health coaches. Beginning July 1, 2017, SCHDDS made treatment options available for all full-benefit Medicaid members including all seven FDA-approved medications with no prior authorizations, co-pays, and included medically appropriate combination therapies. Episcopal Health Foundation’s Texas Community Centered Health Homes (CCHH) Initiative is a four-year, $10 million investment to create more active roles for clinics to address the community conditions that lead to poor health. The initiative creates a model for 13 community-based clinics to go beyond the exam room with a systematic approach to address the non-medical factors that contribute to poor health. Clinics are developing specific ways to take community-wide action to prevent illness and improve health, not just healthcare in the areas they serve. Poverty, substandard housing, lack of affordable healthy food, and limited safe places to exercise are a few of the underlying conditions that contribute to high rates of chronic health issues like obesity, diabetes, heart disease, asthma, and more. As described by Prevention Institute, a CCHH clinic “not only acknowledges that community conditions outside the clinic walls affect patient outcomes, it actively participates in improving them.” The CCHH approach goes beyond patient-only treatments and promotes change at the systems and community levels. Clinics are partnering with community groups, government agencies, schools, businesses, and other organizations to create community-wide prevention strategies and other similar efforts. NORC at the University of Chicago developed this case study of supportive service expansion for individuals with serious mental illness enrolled in the Mercy Maricopa Integrated Care Medicaid managed care plan in Maricopa Counta, Arizona, through a series of structured interviews with stakeholders ranging from service providers to patient advocates. This case study provides background and historical information on Mercy Maricopa and the population it serves and examines the 1) policy drivers, 2) partnerships, and 3) organizational decisions and staffing alignment that have influenced Mercy Maricopa’s implementation of expanded support services, including employment and housing supports. The case study also explores the successes and challenges identified by stakeholders. Several key policy and legal drivers played a significant role in the implementation and expansion of supportive services for the serious mental illness and general mental health and substance use disorder populations in Maricopa County, specifically the Regional Behavioral Health Authority transition and the Arnold v. Sarn court decision. Building partnerships with government officials, providers, and stakeholders involved with the serious mental illness community has been an important part of Mercy Maricopa’s process when designing, implementing, and expanding its care model. These partnerships have enabled Mercy Maricopa to create a system of care that is responsive to and anticipates the needs of its members. Mercy Maricopa has made several strategic network and staffing decisions that have played important roles in the implementation of Mercy Maricopa’s expanded housing and employment support services program for individuals with serious mental illness. Establish a Member-Centered Framework: Mercy Maricopa takes a “member-centric” approach, focused on ensuring that members have maximized agency in obtaining and directing their services and supports. Strengthen and Maintain Stakeholder Partnerships: Mercy Maricopa leadership was deliberate about incorporating itself into the local network of organizations working with individuals with serious mental illness, enabling it to unify its service delivery approach by ensuring that strong connections with providers led to consistent and best practices across clinics. Nurture and Sustain Good Communication: Mercy Maricopa has worked closely with providers to help clearly communicate expectations, focus on improvement, and enhance relationships, promoting substantial growth and flexibility. Be Strategic with Resources: Strong partnerships with robust communication also encouraged Mercy Maricopa to identify strategic uses for limited resources. The Challenge: AmeriHealth Caritas District of Columbia has long recognized that access to affordable, convenient and reliable transportation plays a crucial role in terms of member access to important preventive health services. When it’s highly inconvenient to get to the doctor, members often put off care until situations become urgent, which often results in ambulance calls, emergency room (ER) visits and hospital stays. Like other Managed Care Organizations (MCOs), AmeriHealth’s traditional non-emergency medical transportation (NEMT) options for Medicaid recipients in the Washington D.C. area required three- to five-day notice. These trips also tended to be longer than needed, mostly because 1) members had to be picked up well in advance of their appointments and 2) drivers had to pick up and drop off multiple riders throughout the trip. Often times, this situation resulted in members having to give up a half-day of work or more just to go to the doctor. The Solution: In November of 2017, AmeriHealth set out to address this situation by forming a relationship with Lyft to provide on-demand transportation services to AmeriHealth Caritas DC members. Today, as part of this relationship, AmeriHealth uses Lyft in two ways. AmeriHealth members can call into the AmeriHealth Caritas DC Community Outreach Solutions Team which can book rides directly for members through the Lyft Concierge online portal. Rides booked through this channel are focused on transportation to and from plan sponsored health promotion programs, health education classes and related valued added services. And when members want to schedule rides for medical services, they call the non-emergency transportation (NEMT) toll-free number on the back of their membership card, which connects them to AmeriHealth’s transportation broker, Access2Care. Access2Care has significant experience in the NEMT space and it has extensive experience in working with Lyft, booking services through their customized Lyft portal. The Results: Preliminary analysis revealed a significant reduction inpatient stays, ER admissions, and emergency ambulance transportation utilization for those members taking Lyft trips during the initial launch of the Lyft program. These findings were based upon examining claims data six (6) months prior to a member’s first Lyft trip and claims data for that same member six (6) months after their first Lyft trip. Furthermore the program has been correlated with a significant positive impact on the plan’s HEDIS results. The plan found that members using Lyft had higher compliance scores on thirty-two (32) of forty-two (42) or seventy-six percent (76%) of the measures and the members using Lyft had a statistically significant higher compliance score for nineteen (19) or forty-five percent (45%) of the measures. And Lyft users had a ninety-five percent (95%) compliance rate on the Adults Access to Care measure as compared to sixty-nine percent (69%) of all other eligible members and a ninety-six percent (96%) compliance rate on the Children and Adolescents Access to Care measure as compared to eight-eight percent (88%) of all other eligible members. Kaiser Permanente’s innovative framework – “total health” – uses and aligns all its resources to maximize physical, mental, and social wellbeing for its beneficiaries and the communities in which they live. These resources include sourcing and procurement, workforce pipeline development, training, investment capital, education programs, research, community health initiatives, environmental stewardship, and clinical prevention. Kaiser Permanente recognizes the importance of access to health-promoting environments (e.g. work, school, and diverse community settings where people spend much of their time) in addition to working on individual behavior changes. In order to address the social and non-medical needs, Kaiser Permanente also screens patients for unmet social needs and refers them to resources in their communities. In order to locate and refer patients to resources that address social needs, the healthcare system must have a standardized approach to screen for these conditions and document them. In August 2016, after surveying different tools available, SelectHealth elected to implement the PRAPARE one-question social determinant of health screening as a part of our overall strategy. SelectHealth piloted the PRAPARE screening in our Care Management program as a part of the member’s initial and ongoing assessments for all lines of business. SelectHealth has analyzed this data to look for trends in unmet needs and build a partnership with United Way 2-1-1 Program to create more effective referrals to community resources. During this process, gaps in services were identified like urgent transportation for Medicaid members. This led to the creation of a pilot program where Care Managers can order a ride for Medicaid members who need urgent care but do not have access to transportation. Work to further expand PRAPARE screenings throughout the Intermountain Healthcare system in clinics, hospitals, and specialty services began in September 2017. The University of Maryland St. Joseph’s Medical Center (UMSJMC) and Maxim Healthcare Services – a home health provider – partnered to tackle social determinants of health for the hospitals high-risk patients. Through an opt-in program, UMSJMC uses Maxim’s non-medical community health workers (CHWs) to address social determinants of health for these patients discharged from the hospital. As a result, the hospital’s spending decreased by 35 percent and cut readmission rates in half. Maxim Healthcare Services’ Community-Based Care Management program provides patients with a CHW focused on helping them navigate the barriers to their care, engage in their recovery, and ultimately reduce healthcare costs. Rather than providing medical services, CHWs harness community resources to keep patients healthy and address the behavioral and psychosocial needs of high-risk patients in-home. That includes transportation, housing, employment, access to medical services, and other social determinants of health, all of which can be barriers to proper care following discharge from the hospital. As a result, only 8 percent of patients who chose to participate in the program were readmitted to the hospital within 30 days of discharge. That’s compared to 18 percent of patients who opted out of the program. At 90 days post-discharge, 23 percent of program participants had returned to the hospital, compared to 34 percent of non-program participants. Following the program’s launch in 2015, there has been a 65 percent reduction in readmissions. Over a two-year period, the reduced readmissions have generated more than $3 million in savings. CHI St. Vincent Infirmary in Little Rock, Arkansas used TAVHealth’s cloud-based collaboration platform, TAVConnect, to address vulnerable patients who became reliant on the emergency department. Through their Health Connections Initiative (HCI) pilot program, TAVConnect was used to increase coordination, collaboration, and manage social determinants of health among participants. TAVHealth identified the most vulnerable members through hot spotted zip codes and integrated the highest ED utilizers and their demographics in the TAVConnect platform. Collaboration among health and community partners increased coordination for these patients’ post-acute care. Social workers performed home visits to identify each patient’s social determinants of health and assigned the social risk to the most appropriate community resource. As a result of this initiative and partnership with TAVHealth, a 30 percent reduction was seen in 30-day hospital readmission rates, 35 percent reduction in inpatient rehab admission, a 17 percent reduction in cost per patient admission and a 10 percent reduction in the length of inpatient admissions. In addition, patients reported an increase in their confidence to manage their health, more meaningful relationship with their PCP, and reduced symptoms of depression. Families living with autism in San Antonio, Texas have access to an abundance of community organizations providing a range of support services. Unfortunately, without a shared platform for collaboration, the amazing work of these organizations was undermined by limited coordination. This caused delayed response times for families, redundant data collection, and inconsistent outcome reporting by the agencies as required from their sponsors. To resolve these issues, the Kronkosky Charitable Foundation partnered with TAVHealth to launch Autism Lifeline Links (ALL), a collaborative program that increased coordination among community organizations to jointly manage social determinants of health and improve outcomes. Through its cloud-based collaboration platform, TAVHealth connected 10 autism support organizations, increasing collaboration by 10x to collectively identify and solve social determinants of health. Families seeking autism support could now enroll in ALL through a single point of entry. The platform provided structure, accountability and visibility across all 10 community organizations. They could operate as a unified virtual team, managing shared workflows, safely sharing information, and assigning the best resources to resolve members’ needs. Real-time analytics allowed ALL to monitor and measure client volume, agency referral trends, and Pathway usage and could now identify and quickly remedy gaps in platform adoption and collaboration. By eliminating duplicative reporting efforts and maximizing agency resources, average response times dramatically improved from two weeks to 24 hours. 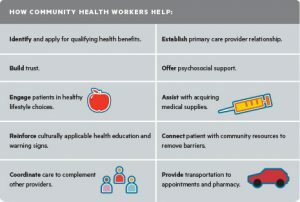 A 9x increase in accountable referrals allowed community organizations to collectively solve 90 percent of all identified social determinants of health. Additionally, family enrollment burden decreased by 50 percent. Healthcare organizations can have multi-tiered needs around protected health information (PHI) at the organization, state, and even local-level. Healthify, a healthcare company focused on addressing the social needs of individuals through technology and services, has developed flexible client data privacy requirements to accommodate PHI policies. Healthify’s platform allows organizations to coordinate referral information to a network of partners and creates guardrails within the application to ensure that clients and their users are abiding by specific procedures. Although Healthify doesn’t determine policy for its clients, the framework of the technology enables them to determine what level of PHI to send, or share, with a social agency or community partner. For example, a case manager at a health plan can screen an individual with HIV/AIDS for social needs and identify that they need supportive housing and a food intervention. The individual’s information entered into Healthify’s application is contextually dependent on what the healthcare organization has deemed necessary to share with each community partner. Because only basic information is needed to initiate a referral with a food bank, the details around HIV/AIDS are not included when the referral is sent and can’t be seen if the community partner views the member’s profile. These controls can be scaled down and up as appropriate based on each organization in the network. As part of the Early Childhood Results Count (ECRC), which is a community effort led by E3 Alliance and United Way, one of the key barriers identified in achieving the goals of this initiative is lack of data sharing across health, education, and human service providers. The community stakeholders are partnering with Dell Medical School (DMS) to develop a data infrastructure (linking social determinants and clinical data) to serve as the back-end data storage and management platform. The governance of the data will reside in a community-based intermediary organization. An integral part of the system will be an intermediary interface application for managing consent and referrals. For early childhood interventions in the community, Austin Independent School District (AISD) is ready to partner with DMS to share school district data for purposes as approved by a governance infrastructure. The governance body will comprise key community stakeholders and include AISD and DMS. The preferred way that AISD legal team has proposed sharing this data with DMS platform is for DMS to act as an “agent” for AISD to store and process the data. Early interventions based on this effort will not only benefit the children and families involved, but can also reduce or even eliminate the need to provide special services for children when they get older, thereby providing significant financial benefits for school districts.